GF Piping Systems will introduce the Signet 3-0486-D Profibus Concentrator at AWWA-ACE Conference & Expo 2016, Booth #2039, June 19-22, at McCormick Place in Chicago, Illinois. 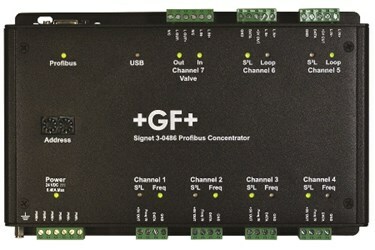 The new Signet 3-0486-D Profibus Concentrator communication protocol allows users to connect multiple GF Signet sensors, GF actuated valves and other products to their automation system, thereby reducing wires, cables, set-up time, and maintenance. The device meets UL, CSA and IEC61010 Safety approvals, has passed the EU and FCC requirements for EMI and EMC, and is certified by Profibus International. “By merging our easy-to-use products with advanced digital communication technologies, automation professionals now have a powerful new tool in their arsenal,” says Dan Oshaben, Product Manager for GF Piping Systems at the company’s El Monte facility in California. The Profibus Concentrator can interface six sensors, plus an additional 4 to 20 mA current loop input and output channel with proportionally controlled actuated valves or other 4 to 20 mA devices. GF Piping Systems supplies a full range of full range of plastic pipe, fittings, valves, actuators, variable area flowmeters, fusion machines, secondary containment, heat exchangers, custom products, and sensors and instrumentation for industrial process control. The Georg Fischer Signet LLC facility, located in El Monte, California, is the development, manufacturing, and logistics organization for Signet flow and analytical measurement systems. For more information, visit www.gfsignet.com.